The Place Daddy Goes To When He Is On A "Business Trip"
Motto: "We can do anything you want... anything... for a price." Who said anything about Independence? This section is now blocked. Unfortunately in recent years Macau has come to be associated with gambling, prostitution and sleaze. Since armed hostilities are now confined to the Chinese government and the poker room of the Rocks Casino, Macau has become a popular spot for tourists and businessmen alike to have a great time and catch exotic water born diseases. There is always something to do in Macau, from swimming with the highly endangered Sewer Water Dolphins to viewing the many historic ruins - palaces, churches and public hospitals. The memories will last long after the intestinal parasites have gone. Macau is truly a land of contrasts, where traffic police wear face masks but surgeons rarely do. Many who visit Macau, intending to stay for an hour, never leave. For the religious among us who choose to believe lies, the so-called experts at Wikipedia think they have an article about Macau. The magnificently preserved Presidential Palace is testament to the history of Macau. On weekends there is usually an hourly display of Communist Army Guards driving military vehicles round the parade grounds while letting off firearms (not an official historical display – they’re generally just drunk). Within the Presidential Palace there are also Portuguese themed slot machines, a very tasteful homage to the Portuguese heritage of Macau. The People's Palace (closed to the public). Macau was founded by the Portuguese in 1409 as a stop over point where sailors could "partake in good, clean entertainment", according to Grand Duke Jaun Chavez. By 1800 it had the highest number of brothels in the world. Macauists have always loved a gamble, in fact Macau's first leader Dat Cao was elected because of a simple poker game. The famed "Five Ace Hand" he used to win is still preserved in the People' Palace. Since casinos were banned on land in China, entrepreneurs were forced to build on a small sandbar in the ocean. The first casinos collapsed in a typhoon, so did the second... and the third but the forth wave survived on the stable foundation left by the collapsed casinos. Because the stable foundation was so small, the country only covers 3 square miles, 2 of which are a sweatshop owned by Mattel. With the gambling revenue increasing exponentially, talk began to spread of becoming independent from Portugal. One of the earliest and most famous leaders of the independence movement was a Jesuit priest Whi Ni Fuk, who issued his famous cry "Viva Macau" from the steps of Macau Cathedral some time during May, 1825. A small group of Macauists gathered below simply assumed that he was drunk again (as he was wearing no pants at the time) and ignored his cry, but the priest refused to be ignored. The Macau parliament sitting in October 1792. Note the senator betting 20,000 gold peices on a tariff increase. He organized a campaign of civil disobedience and a group of freedom fighters to capture Government House in Macau City. Before attacking, Father Fuk inspired the men with a rousing speech, although reading the last rights did not fill the men with confidence. The attack failed and Father Fuk was arrested to be hung, drawn, quartered, shot, stabbed, drowned, fed to tigers, used in traditional Chinese medicine and burnt at the stake. However, in a last minute plea bargain, his sentence was reduced to 90 million hours community service. Gambling continued to increase, and so did crime from local and Chinese gangs up until 1999 when, as a millennium present, China annexed Macau. Macau's major function now is as a resort where Chinese Communist Party Officials can gather to make important executive decisions and father illegitimate children. Residents of Macau taking part in traditional activities. The economy of Macau is based primarily around extortion and gambling. Macau is famous for having the most slot machines in the world, with one in every toilet and many at each intersection. Despite its many political and economic reforms Macau remains the forgotten special administrative region, where a cheapskate taxi driver can earn twice as much as a doctor (though neither require formal qualifications) and new hotels open, and collapse, just as quickly as health inspectors can be bought off. The currency of Macau is the "fuk" (represented by ∂) is equivalent to 0.2 US cents. Unfortunately in recent years, to cope with rampant inflation, it has been devalued to less than nothing. Luckily "fuk" coins are made out of the same mixture as the local delicacy, pig eye dim-sims. While not being as hard as the dim-sim they have twice the lead level, making them highly toxic. For this reason they are only fed to orphans. In the recent past bananas, children and cigars have all been used as legal tender, the latter still accepted by many shop owners. Since animals were banned, people in Macau must find other pets... and they care a lot about them. The major tourist attractions in Macau are the so called "Beautiful Lady" clubs, where only the most beautiful women are allowed to work. Mind you, in Macau beautiful translates as willing, so a few of the more discerning visitors may notice some of the dancers have mustaches and possibly even chest hair. Most tourists are too drunk to notice this or just choose not to, preferring just to listen to the beautiful words spoken by the ladies. These saying may include "The red blossom bends, and drips its dew to the ground. Like a tear it falls." or the sensual "Ripple in still water. When there is no pebble tossed, Nor wind to blow." or the rarely used "Ay Chin-Chi get the damn dead possum outta the freaking pool." Macau has the lowest infant and maternal mortality in Asia, but sadly many thousand Macauist fathers still die during childbirth, the result of celebrating with illegal firecracker displays. ~ Your father on expanding cultural links with Macau. Saftey is paramount on Macau streets so many people choose to install their own airbags. Unfortunately some go a bit overboard. Driving in Macau is not really recommended due to the massive gridlock at all times of day and night. It can take 7 hours to travel one block if you are very lucky. This may be because of the lax building laws that allow buildings to be built in the centre of roads. Most roads are little more than one lane wide (half of this is usually filled with raw sewage). The road rules in Macau are quite straight-forward. Cars and motorbikes drive on the left, buses and trucks drive at their own discretion – at specific times of the day footpaths may be used as a transit lane. Residents must remember to always sound their horn before overtaking, turning, pulling out, pulling in, changing lanes or stopping. It’s also obligatory to sound your horn before sounding your horn and stiff fines apply to those who fail to do so. Voted worlds most hallucinogenic flag of 2005 by the Rotterdam Association of Vexilogy and Emblems (RAVE). Macau has its own distinctive culture, mainly consisting of chain smoking and excessive gambling. Macau prides itself on having the highest number of traffic police per square mile in the world, even allowing them to flag down competitors of the annual Macau Grand Prix (called the compulsory pit stop). So don't feel offended if you are stopped by the traffic police, it is a great honor. Macau's flag was created by Ho Pho Li, Premier of Macau, in a 1925 drinking competition. Li insisted that he "leave his mark on Macau's future". He managed to leave a nasty stain on the flag also. The flag is officially described as a "beautiful lily" but most esteemed vexillologists suggest it appears most like an evil turnip on an acid trip. Macau's flag is the only emblem in the world considered as a hallucinogenic and is therefore banned from display in all countries, except the Netherlands, where its display is actively encouraged. Watch out for drinks that claim they can clean your toilet and kidneys at the same time. Macauist cuisine be best described as bland with a taste and texture like rubber (of which some of the food is made). Be warned, Macauists enjoy eating most kinds of animal, as acknowledged by the local saying "If it moves, it tastes great stir fried." It is not wise to bring pets as most, inevitably, will end up on your plate or hanging in a store front. There is very little for vegetarians in Macau, virtually every meal contains meat of some kind, even most bottled water contains some "Essence of Bark" (dog's tongue) for its aphrodisiac qualities. Strangely the only dish that doesn't contain meat is "Bull Steak". During times of celebration such as Macaunese New Year or Colonization Day Independence Day Annexation Day, the Macauists love to serve a special monkey dish called "Dat Yuk". The monkey is skinned, rolled in spices and slowly roasted over hot coals before being brought to the table and killed. Nearly everywhere in Macau there are local roadside food stalls that provide a truly authentic dining experience. Few of these establishments have menus and so residents find it easiest to simply look at what other patrons are eating. If there are no other patrons or they appear to be doubled over in the gutter, residents may consider moving on. When eating out in Macau most people may, at times, feel a little rushed to finish their meal. This is because in many restaurants the traditional emphasis is not so much on food quality as efficiency, with awards given to the fastest restaurants, not necessarily the ones with the best cuisine. Continuing the trend, the 2007 winner of the Macau Gastroenteritis Guild Medal was the hip, new 5almon-3lla that boasted the amazing figure of 30 meals served each minute with only 15 hospitalizations. Most fast food in Macau is made in China and imported, be warned to check for high lead levels, pet food, paint, paint stripper and condoms filled with pills. Mmmm... Sliced children with broccoli, snow peas, carrots, water chestnuts. Just like Grandma used to make. Before she went to prison. Sport has been made illegal in Macau after studies have shown that exercising in the heavily polluted air reduces gambling revenue. The government actively campaigns against exercise with the "balls for cigarettes" campaign, where children's soccer balls are exchanged for packets of cigarettes. Macau annually hosts a motor race in which gamblers with tremendous amount of debt compete for the most spectacular fatal accident. Losers of the race who survive the race will be rewarded by being chopped into pieces by triads. Macau skyline on a clear day. Most Macauists watch poorly made soap operas in their spare time. The best example of this is "Lo Da Krap" or translated "Affairs of Hospital", arguably Macau's most loved soap opera. This romantic medical drama set against the backdrop of a failing casino business, starred Chin Tu Fat as the handsome plastic surgeon turned single father turned author, Wai Yu Kum Nao, and evergreen diva Kum Hia as the seductive millionairess and her evil twin. For his unforgettable portrayal of a gossipy gang boss suffering lung cancer while having an affair with 3 nurses and running Macau's drug trade, veteran actor Hu Yu Hai Ding was awarded the much-coveted Golden Slot Machine (Macau’s most prestigious TV award) as well as a promotion to Triad boss (he was in fact a real gang boss). This compelling show went on to become one of the country’s longest-running series – beginning in April 1990. There is a movie based on the show under production called "Fah Kin Su Pah". Macau's main musical export is the delightful diva, Dat Nho Lai Di, who has acquired the title "Queen of Music" thanks to 11 Plastic Albums. Unfortunately his music career was cut tragically short by a major testicular operation in 2003. A typical toilet in Macau. The laws in Macau are considered by many government officials as rational and sane. Smoking is mandatory in Macau - a person must smoke at least one pack of cigarettes a day - if you fail to reach this criteria you will be inprisoned and face a 35 year jail term. Gambling is also mandatory in Macau - a person must gamble at least 889∂ each day. To cater to this, there are slot machines installed in every toilet, school and surgeon's theater and a roulette wheel in every roundabout. Drugs are grossly illegal in Macau and anyone (except government officials) found carrying drugs will be given the choice to be executed on site or forced to listen to a tape of the local government karaoke party. Most choose execution. Prostitution is "illegal" in Macau but there are hands on studies being undertaken by government officials into whether it should be legalized. Macau traffic on a very light day. There are only 3 trees in Macau since the Macau Nature Reserve was bulldozed to build casino parking. Two of them are dead and the other is dying of passive smoking. Now most biodiversity is confined to the are many pot plants situated in casino lobbies. There are only 2 species of animal native to Macau, both species of pubic lice. They are also most prevalent in strip clubs. Macau is the only country in the world where you can actually drown in the air, this has been referred to as "Macau Cocktail". Many local residents choose to wear scuba gear when doing normal activities. A map of Macau. Note the proposed giant slot machine. The climate of Macau is best described as smoggy, with regular summer acid rainfall. Bringing a proper umbrella is a must when visiting Macau as the acid will eat through anything less than 3 inch thick tin. Do not buy one from a local vendor as a coat of lead paint will not protect you anywhere near as well. Particularly stay away from "edible" umbrellas. Smoggy and possibility of toxic waste spill. Smoggy and possibility of communist invasion. ↑ Between 7pm and 3am, apart from public holidays. ↑ Except for eating and cheesy circuses. 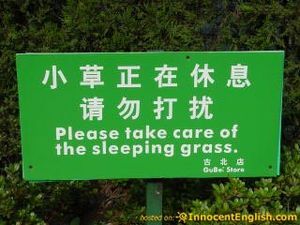 ↑ stepping on the grass will result in a lawsuit. This page was last edited on 30 May 2012, at 05:16.